Utilizing self-storage services is not only useful residential purposes but can be extremely beneficial for commercial use. Cluttered office or retail space not only lacks appeal for clients/customers but can hinder employee morale (after all who wants to work in a cluttered, unorganized space?). Not to mention, office/retail space can be pricey; an efficient and organized space is most cost effective and conducive for business expansion. Taking advantage of self-storage services for your business can assist with keeping track of inventory as it provides a safe, secure, efficient and easily accessible option to store inventory in an organized manner. 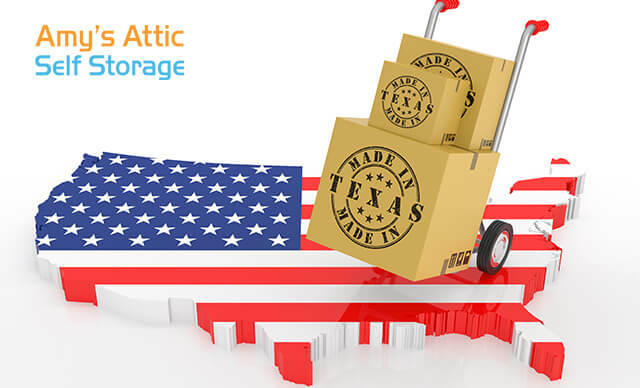 Amy’s Attic Self Storage is perfect for commercial storage for Central Texas businesses with seven locations situated near major roads and highways throughout Central Texas. Amy’s Attic Self Storage offers a variety of storage unit sizes, as well as options for RV/Boat/Vehicle storage at several locations. We also offer options for climate controlled or individually alarmed units for your valuable and/or items especially susceptible to changes in temperature or humidity, such as, documents, electronics, fabrics, antiques, etc. With 24-hours gate access at almost all locations, you can rest assured knowing that you will be able to access your belongings whenever you need to. At Amy’s Attic Self Storage you can also be 100% confident that your belongings are secure, with security features such as, electronic gates with passcode protected keypads, 24-hour surveillance cameras, and ample lighting. With month-to-month leasing, you don’t have to worry about being locked into an annual contract (although Amy’s Attic Self Storage offers annual discounts), which can be a huge benefit if you need to change or upgrade unit sizes due to business growth. Also, for your convenience upon special request, some of our locations allow occasional UPS, FedEx, and USPS deliveries. Other convenience features include clean restrooms, moving and storage supplies (for those times of inventory reorganization), on-site ATMs, wide driveways, and free move-in truck. Amy’s Attic Self Storage also offers several easy ways to pay like auto-pay, online or call-in payments and accepts Visa, MasterCard, Discover, and AMEX. Whether you are a government / municipal park manager or a construction contractor needing to store large machinery equipment or a consignment shop owner looking to store seasonal merchandise, Amy’s Attic Self Storage has a storage solution to meet your unique business needs. Our friendly, knowledgeable staff members look forward to helping you save time and streamline your workday by answering any questions you may have about business storage units. Below are several tips to consider when utilizing self-storage services for your business needs. Consider a climate controlled unit to keep inventory and documents in the best quality. Configure your unit in a way that works for your specific needs, but make sure there is some method to the way things are stored. Consider creating zones (shelves, whole wall, etc.) and then create and label sections (so many feet of shelf, cupboard, etc.) within each zone. Label products. Make labels particularly descriptive (noun, color/design, size, measurement by which a product is sold), noting specific variations. Assign completely unique (not manufacturer number as they change frequently) item code number. Store products with a higher demand where they are more accessible, such as, close to the entrance of the unit. Check-in frequently. Audit a small sample of products frequently to gauge inventory accuracy as to not have to check all inventory at one time. This increases inventory accuracy and you will have a better idea of the time frame you sell-through specific items. Consider Inventory Management Software (IMS) to streamline some of the manual accounting and inventory work. Are you looking to brainstorm ways to leverage self storage services for your business? Our trained managers would be delighted to consult with you on your business challenges and how our storage solutions can possibly help. Please see the list below for the closest storage location to your business.